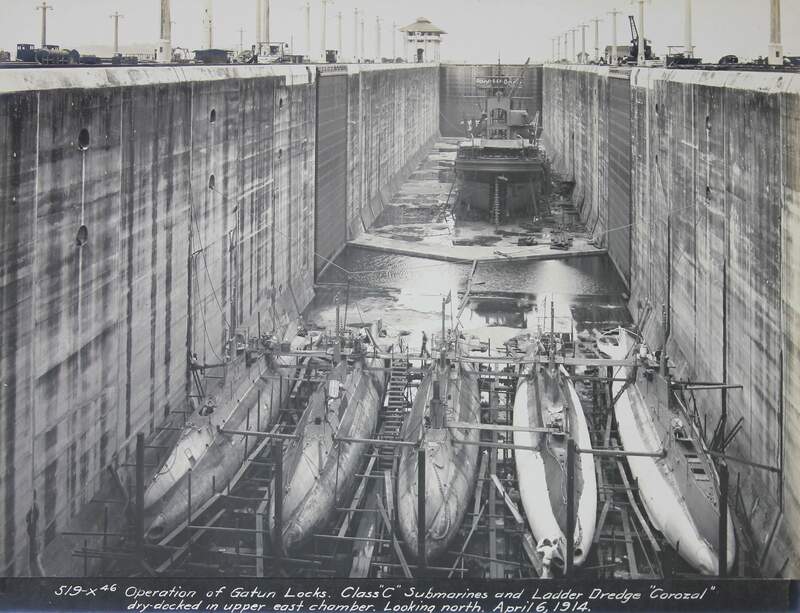 C Class Submarine: Laid down, 17 March 1908, at Fore River Shipbuilding Co., Quincy, MA. 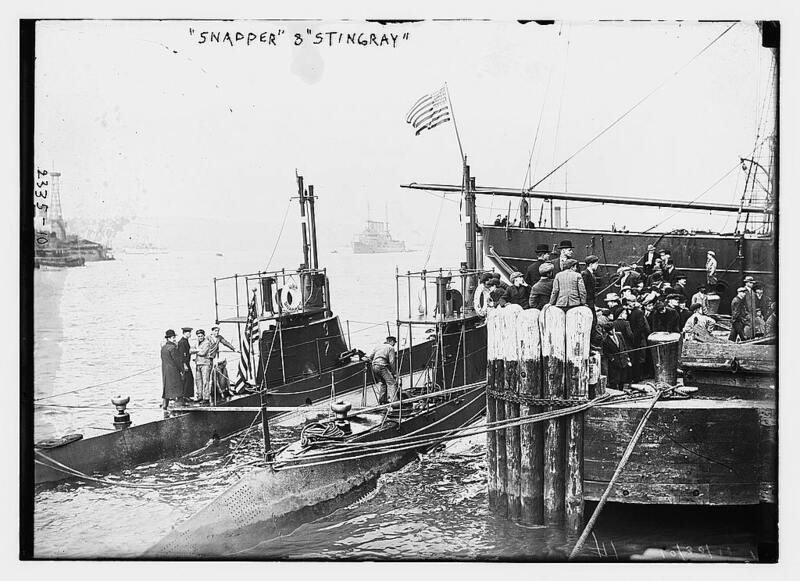 ; Launched, 16 June 1909; Commissioned USS Snapper, 2 February 1910; Renamed USS C-5, 17 November 1911; Decommissioned and struck from the Naval Register, 23 December 1919, at Coco Solo, C.Z. ; Final Disposition, sold for scrapping, 13 April 1920. 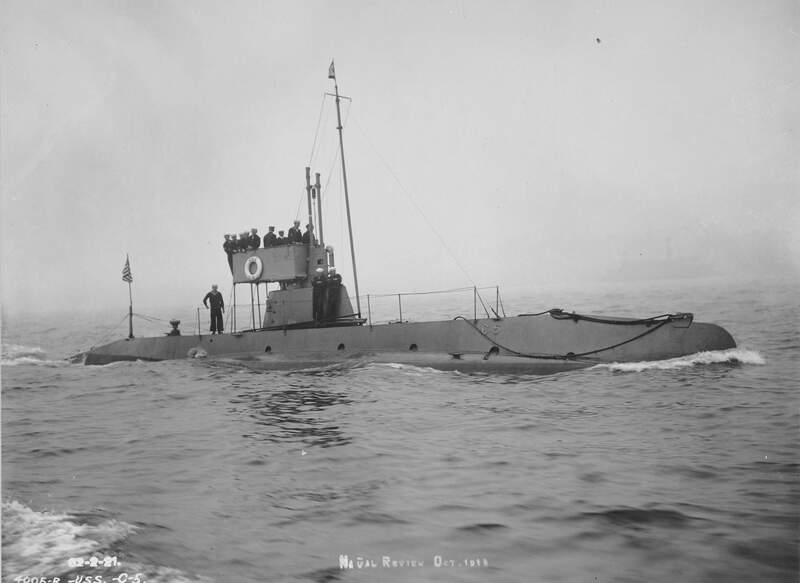 Specifications: Displacement, surfaced 238 t., submerged 275 t.; Length 105' 4"; Beam 13' 11"; Draft 10' 7"; Speed, surfaced 10.5 kts, submerged 9 kts; Depth Limit 200'; Complement 1 Officer, 14 Enlisted; Armament, two 18" torpedo tubes, four torpedoes; Propulsion, gasoline electric, Craig Shipbuilding Co. gasoline engines, 250 hp, Fuel Capacity 1,880 gal., Electro Dynamic Co, electric motors, 150 hp, Battery Cells 60, single propeller. 153k C-5's (SS-16) first skipper, Chester William Nimitz (before photo). 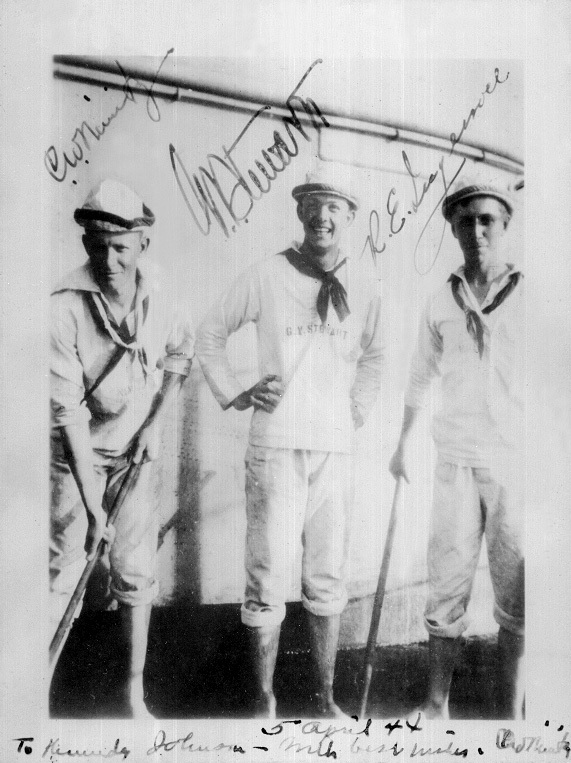 Nimitz on the left, center is George Vanderbilt Stewart, Lineal # 02746, USNA Class of '05. and R.E. Ingersoll (later Atlantic Fleet Admiral). Photo taken about 1905. 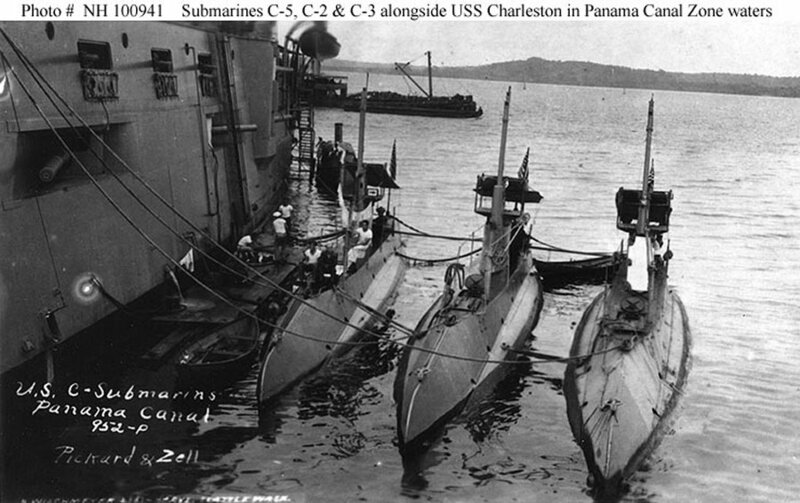 Nimitz Lineal # 02705, and Ingersoll 02702." I believe Stewart retired in June 1940 as a Captain. Photo courtesy of Kennedy Johnson & submitted by Tom Kermen. Photo i.d. courtesy of Ron Reeves (of blessed memory). 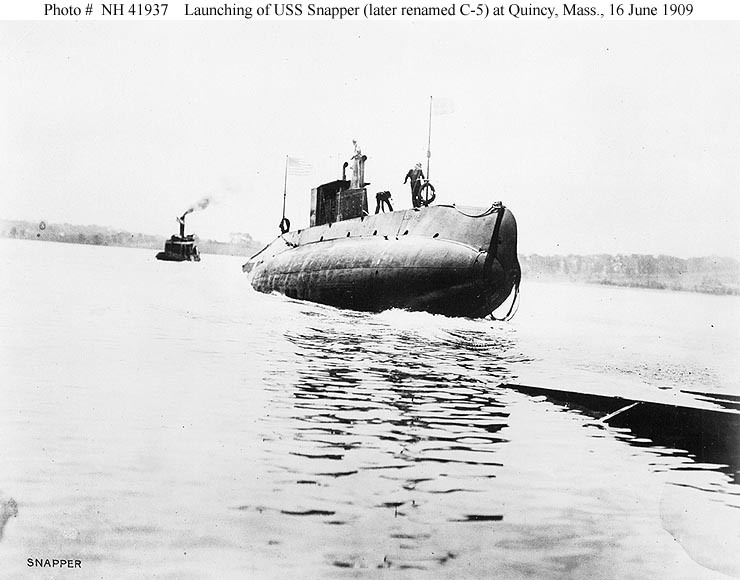 67k Launching of the Snapper (SS-16) at the Fore River shipyard, Quincy, Massachusetts, 16 June 1909. Courtesy of Howard I. Chapelle, Smithsonian Institution. U.S. 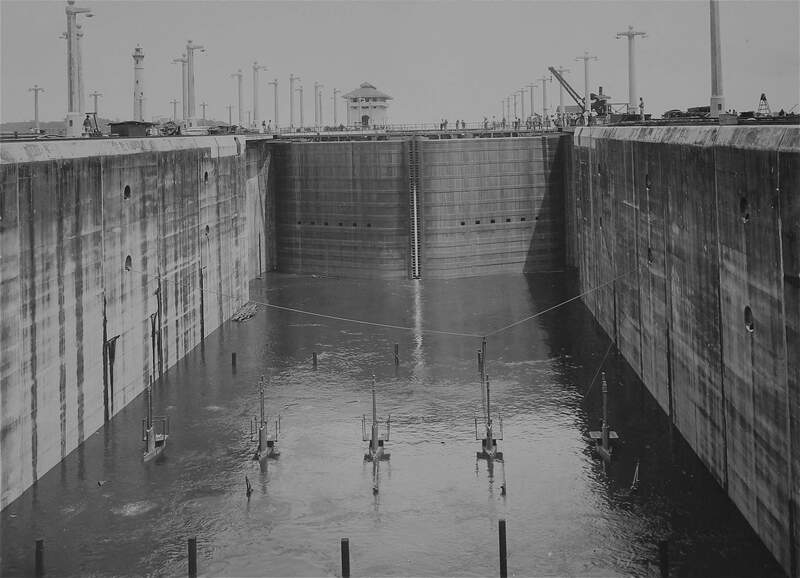 Naval Historical Center Photograph, # NH 41937. 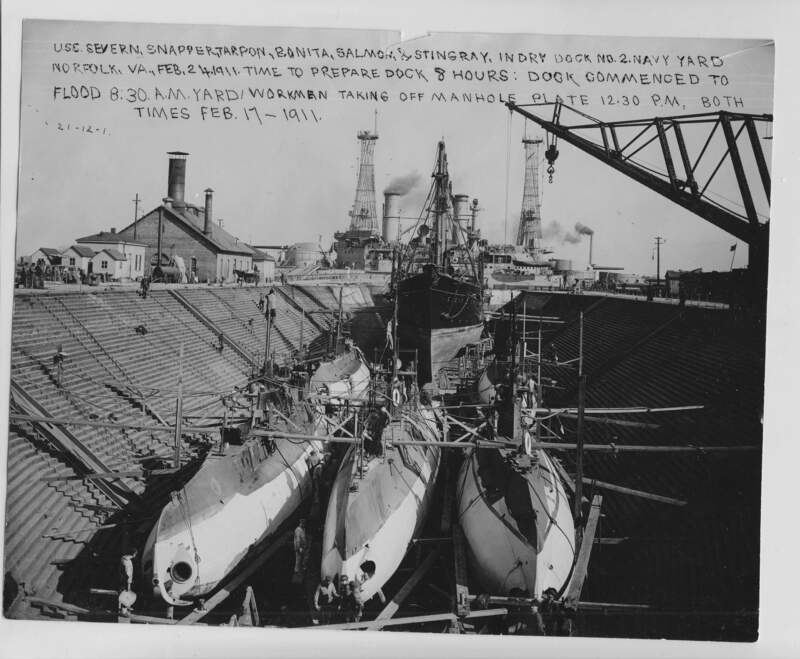 Fitting out at the Fore River Shipyard, Quincy, Massachusetts, during the summer or fall of 1909. Photograph # NH 99004 courtesy of the U.S. Naval Historical Center. 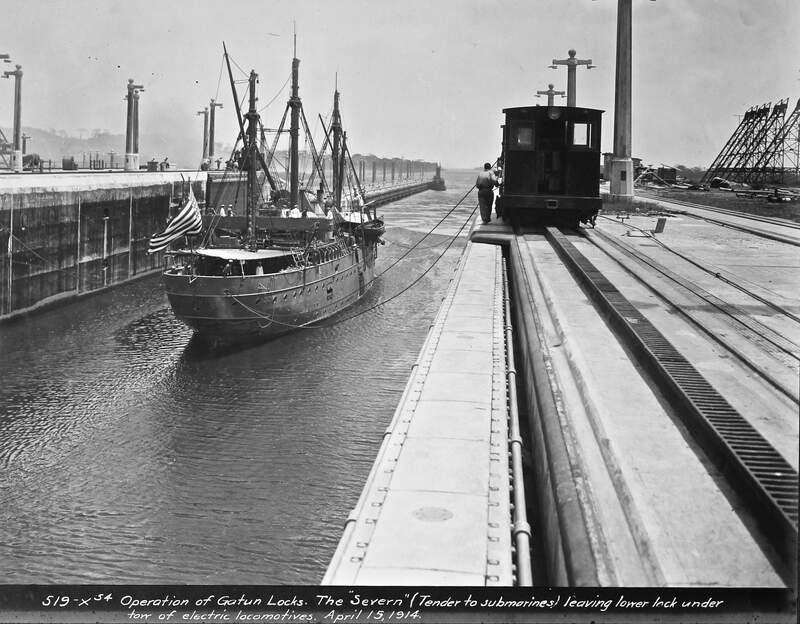 Fitting out at the Fore River Shipyard, Quincy, Massachusetts, during the summer or fall of 1909. 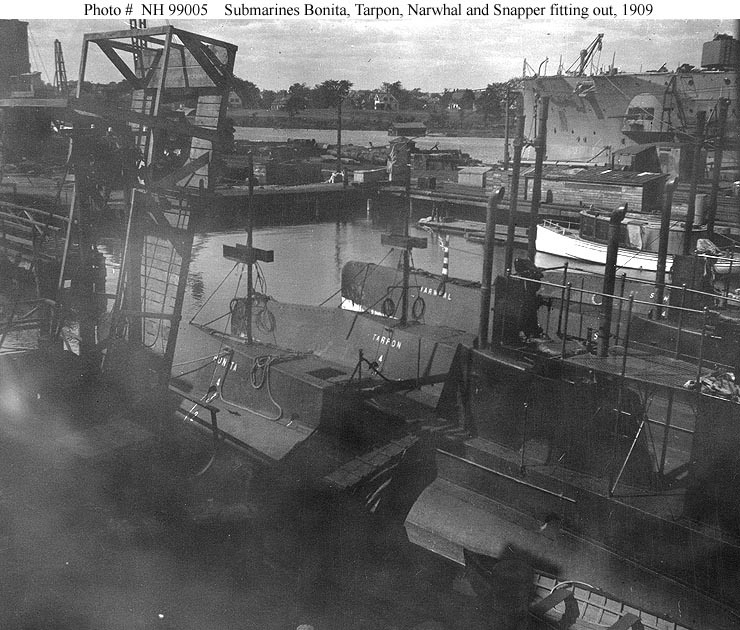 North Dakota (BB-29) is in the right background, also fitting out. Photograph # NH 99005 courtesy of the U.S. Naval Historical Center. 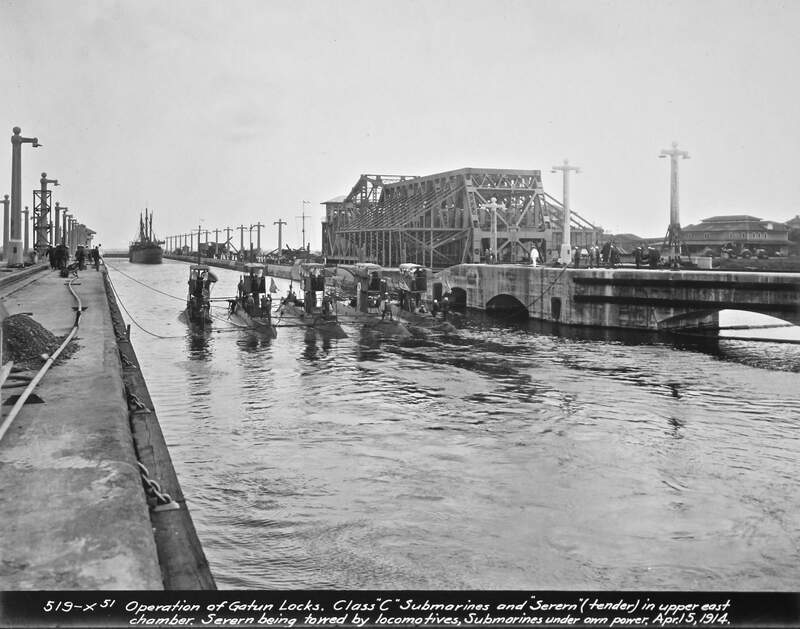 fitting out at the Fore River Shipyard, Quincy, Massachusetts, during the summer or fall of 1909. U.S. 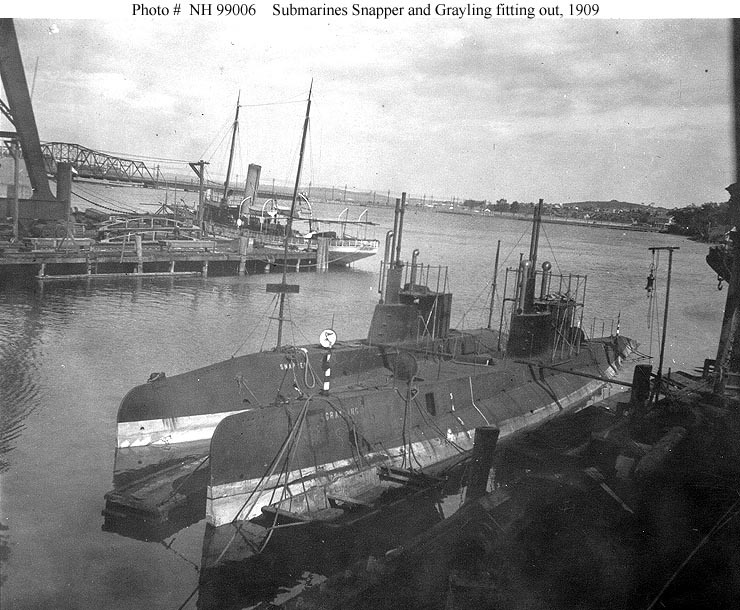 Naval Historical Center Photograph, # NH 99006.
and Grayling (SS-18). Photograph # NH 53776, courtesy of the U.S. Naval Historical Center. 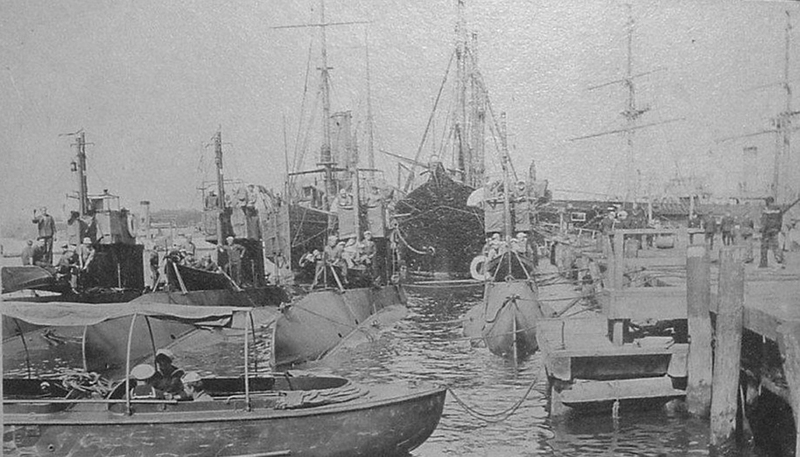 Note their 13-star "boat" flags. Photograph # NH 92953 courtesy of the U.S. Naval Historical Center. 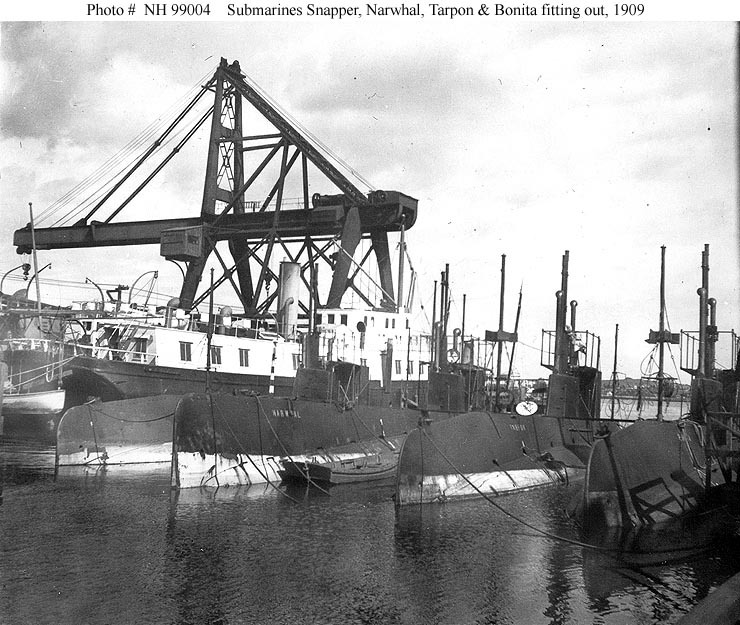 163k Snapper (SS-16) & Stingray (SS-13) near the bow of their tender Severn between 1910 and 1915. Digital ID # ggbain.09978, LC-B2-2335-10. Source: Library of Congress Prints and Photographs Division, from the George Grantham Bain Collection, courtesy of Tom Kermen. 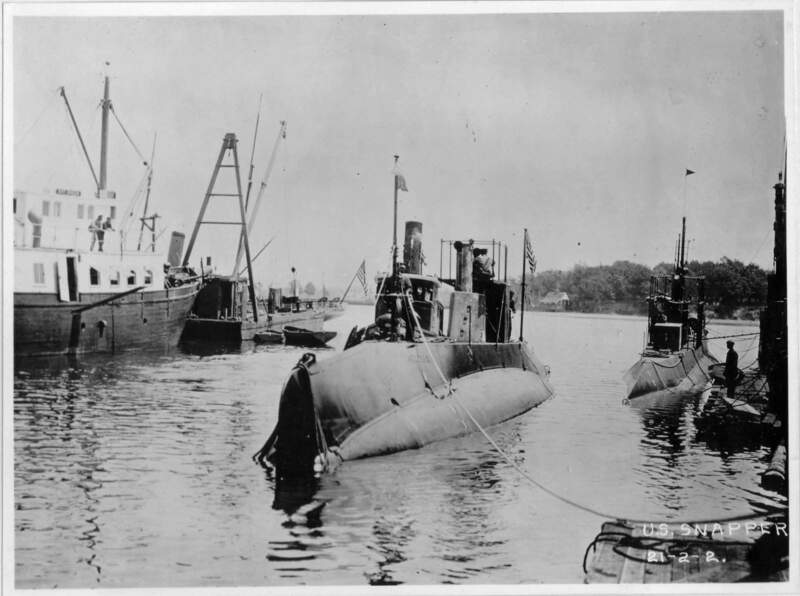 2.76k Tender Severn, Snapper (SS-16), Tarpon (SS-14), Bonita (SS-15), Salmon (SS-19), Stingray (SS-13) in Dry Dock # 2, Navy Yard Norfolk VA., 24 February 1911. Time to prepare dock 8 hours: Dock commenced to flood 8:30 AM. Yard workmen taking off manhole plate 12:30 PM. 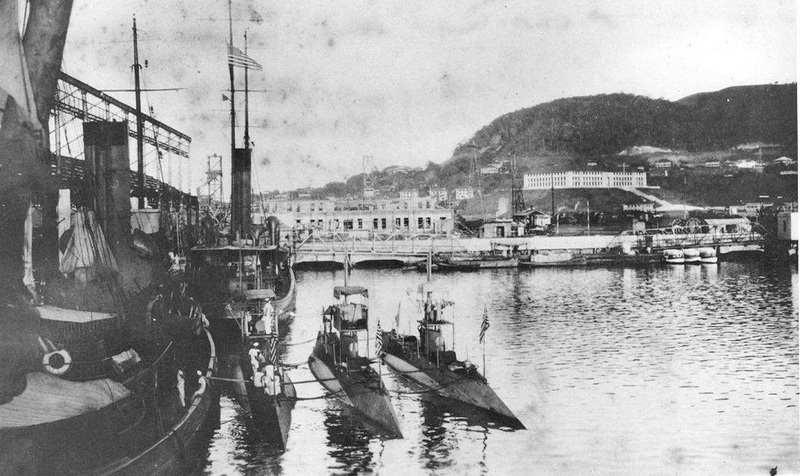 Between 1 November 1910 and 12 January 1911, South Carolina (BB-26) voyaged to Europe and back with the 2d Battleship Division. This visit took her to Cherbourg, France, and Portland, England. 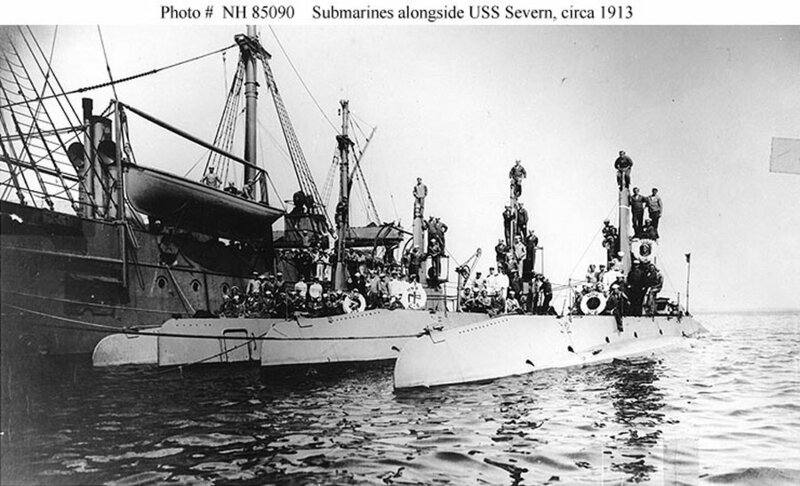 Upon her return to Norfolk, she entered the navy yard for repairs, and then conducted tactics training and maneuvers off the New England coast. The South Carolina is the battleship in the background. Partial text courtesy of DANFS. US National Archives photo from National Archives and Records Administration (NARA), College Park, Maryland, courtesy of Sean Hert. 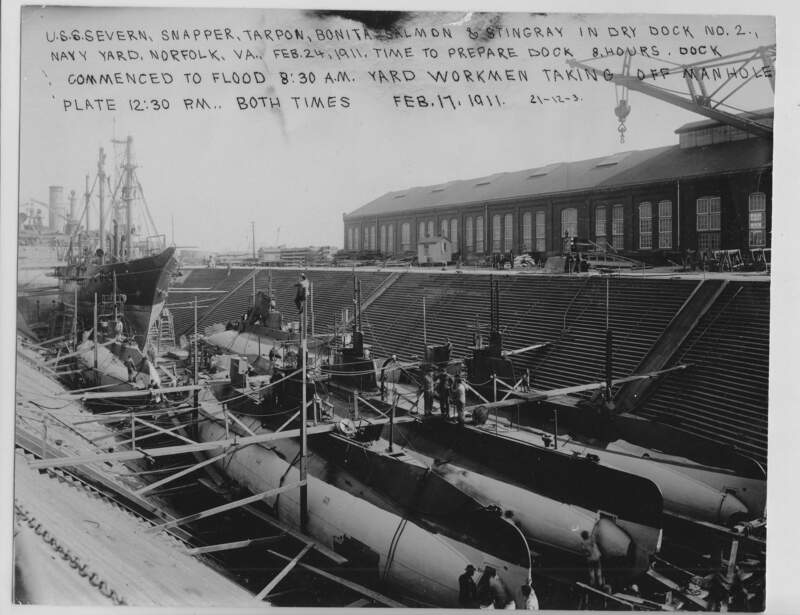 2.47k Tender Severn, Snapper (SS-16), Tarpon (SS-14), Bonita (SS-15), Salmon (SS-19), & Stingray (SS-13) in Dry Dock # 2, Navy Yard Norfolk VA., 24 February 1911. Time to prepare dock 8 hours: Dock commenced to flood 8:30 AM. Yard workmen taking off manhole plate 12:30 PM. both times. Note the # 32 on the sail of the Salmon. US National Archives photo from National Archives and Records Administration (NARA), College Park, Maryland, courtesy of Sean Hert. Photo from New-York Tribune. (New York [N.Y.]) 1866-1924, 2 July 1911, Image 17, via chroniclingamerica.loc.gov. 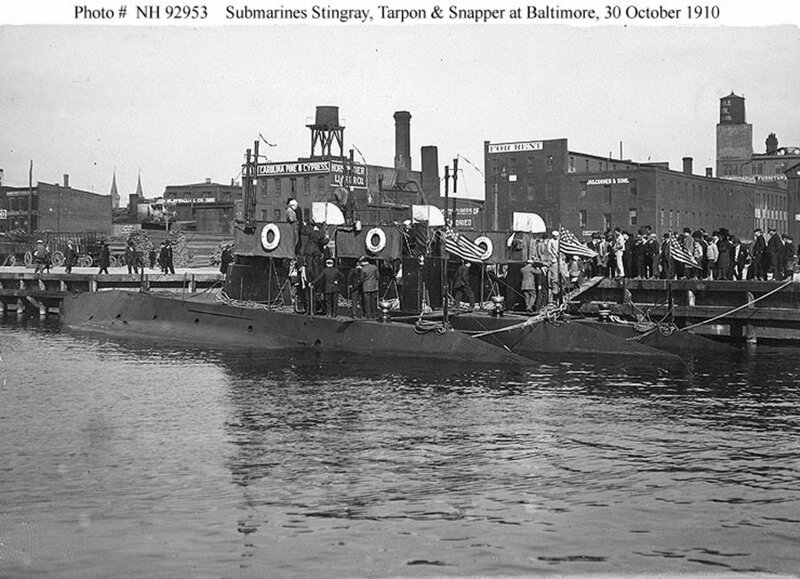 and C-2 (SS-13). U.S. 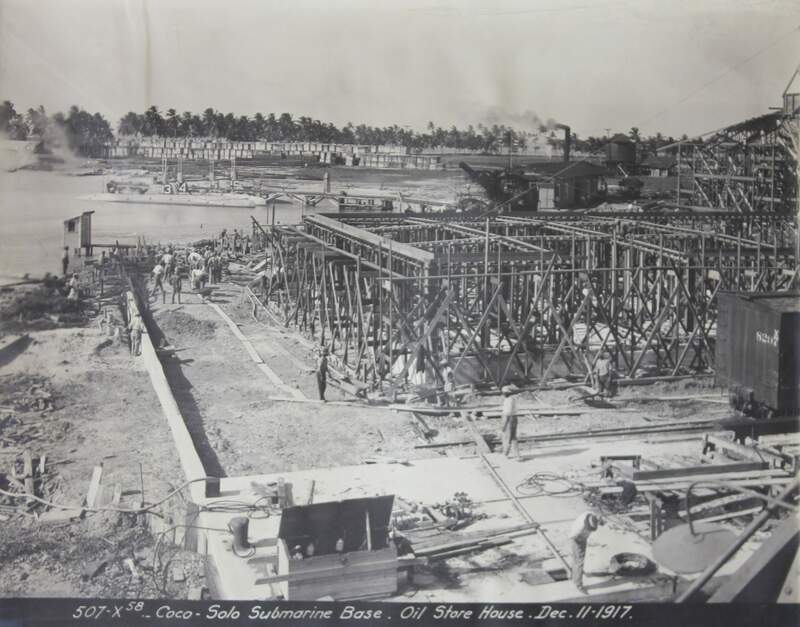 Naval Historical Center Photograph # NH 85090. 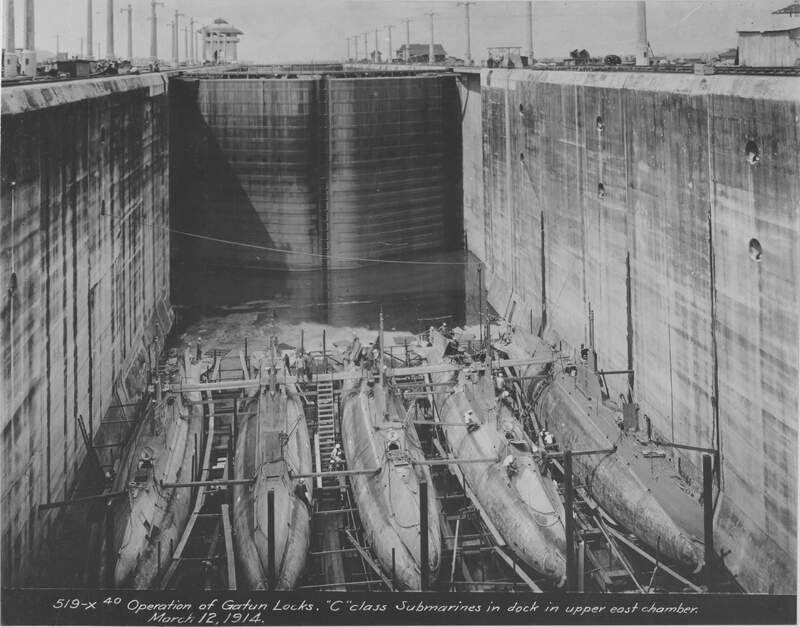 The submarines present from Left to right are:C-4 (SS-15), [#12 on her conning tower], C-5 (SS-16), [#14 on her conning tower]; C-3 (SS-14), [no visible number on her conning tower]; C-2 (SS-13), [#15 on her conning tower]; C-3 (SS-14), [no visible number on her conning tower]; C-5 (SS-16), [#14 on her conning tower]; & C-1 (SS-9), [#13 on her conning tower]. Photo i.d. courtesy of Ric Hedman. Photographed by Pickard & Zell. 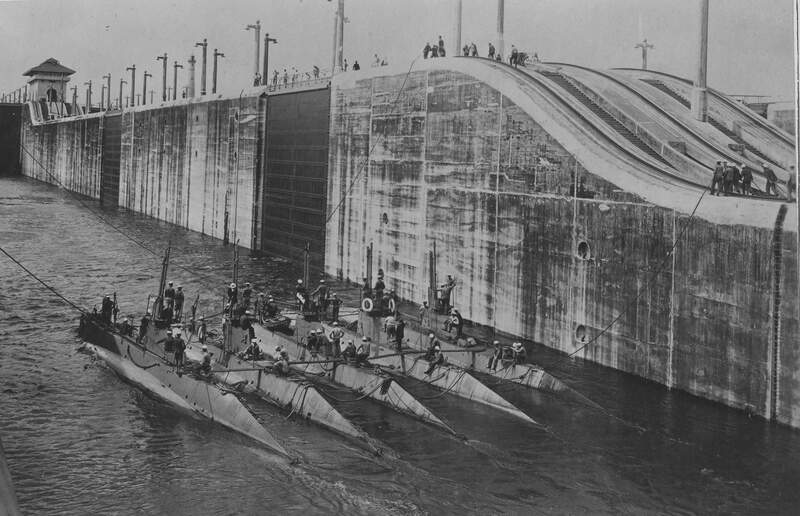 Note the small rowboat, and Sailors washing clothing on the float between the cruiser and the submarines. U.S. 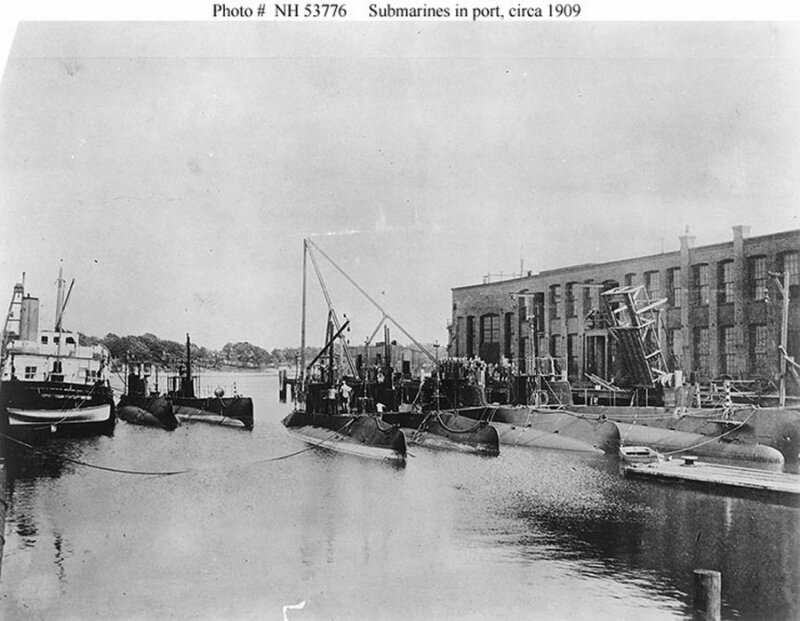 Naval Historical Center Photograph # NH 100491. 145k C-5 (SS-16) bow view, date and location unknown. USN photo # 19-N-14893, from the National Archives and Records Administration (NARA), courtesy of Daniel Dunham.